How Often Should I Clean My Apartment? Wondering how often you should clean the rooms in your apartment? Continue reading! Unless you have a passion for cleaning, keeping your entire apartment clean at all time can be a bit of a challenge. If you live with a roommate or partner, it can be especially difficult if you have different cleaning expectations. However, discussing cleaning habits and your expectations of how often rooms should be cleaned if a good place to start. Here are a few tips on the rooms that need the most attention, and how often you should complete certain cleaning tasks. Since the kitchen is where all the food preparation and cooking is done, it should be cleaned very frequently. This means more than just cleaning up dirty plates and cooking items, as you want to ensure the kitchen is as clean as possible for sanitary reasons. Wipe down countertops before and after preparing food, clean up any microwave or stovetop spills quickly before the stain and become harder to clean, and wipe your fridge clean each time you buy new groceries. One trick to save time is to clean from the top down, starting with dusting the kitchen cabinets, appliance tops, and light fixtures. As you clean, dust often falls to other locations or the floor, and started from the top and working your way day ensures you won’t miss any fallen dust. The living area and bedroom are often the two most-used rooms in your apartment, and furniture such as couches and beds can get dirty quickly. Dust tends to pile up quickly in these environments, and vacuuming once a week is a great way to keep the rooms clean and dust-free. Wood surfaces and shelves also build up a lot of dust, so use a dusting brush or cloth about once a week. Floors should get a quick sweep every few days, and a more thorough vacuum once a week. Cleaning the rooms of dust is important for staying healthy, as the longer you breathe in dust, the greater the chance it will affect your health. 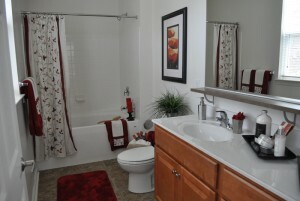 The bathroom also needs very frequent cleaning, and some parts of your bathroom may need to be cleaned daily. For example, you counter and sink should be disinfected each day, especially when close to the toilet. This task only takes a few minutes but is important for your health. Other cleaning tasks can be done once a week, such as cleaning the shower tiles, washing your towels and bath mats, and mopping the floor. This entry was posted on Friday, February 16th, 2018	at 2:26 pm	. Both comments and pings are currently closed.